Fireweed, having a preference for disturbed soil, tends to appear and multiply after fires or logging. Its root systems can act as a stabilizer, initiating recovery of ecosystems. Is there a similar stabilizer in the human and cultural environment after massive disturbance such as those imposed by the Canadian Government on Indigenous Peoples. In 2018, the Dzawada'enuxw launched an aboriginal title and rights case against the courts to protect their lands and waters from further industry encroachment after 150 years of one-sided negotiation and ultimate negation of their rights by the Federal and Provincial Governments.Through historical research and artistic expression Nicolson seeks to share the Dzawada’enuxw Nation’s story of injustice, resilience and restitution. Marianne Nicolson is an artist activist of Musgamakw Dzawada’enuxw First Nations and Scottish descent.The Musgamakw Dzawada’enuxw Nations are part of the Kwakwaka’wakw (Kwak’wala speaking peoples) of the Pacific Northwest Coast. Nicolson is trained in traditional Kwakwaka’wakw forms and culture with a contemporary gallery and museum based practice. Nicolson works as a cultural researcher and historian for the Kwakwaka’wakw and is an advocate for Indigenous land rights. Her practice is multi-disciplinary encompassing photography, painting, carving, video, installation, monumental public art, writing and speaking. All her work is political in nature and seeks to uphold Kwakwaka’wakw traditional philosophy and worldview through contemporary mediums and technology. Exhibitions include the 17thBiennale of Sydney, Australia; The Vancouver Art Gallery, The National Museum of the American Indian in New York; Nuit Blanche in Toronto, Ontario and many others. Major monumental public artworks are situated in the Vancouver International Airport; the Canadian Embassy in Amman, Jordan and the Canadian Embassy in Paris, France. Nicolson holds a Bachelor of Fine Arts from the Emily Carr University of Art and Design (1996), a Master of Fine Arts from the University of Victoria (2005), and a Master of Arts and PhD in Linguistics and Anthropology from the University of Victoria (2013). Rosanna Raymond, Shark of the Sea, FABrication, 2017, Courtesy of the Artist, Photo by Jermaine Dean. How can the living performative body expand the concept of the Tā-Vā theory? Historically Samoan cultural understandings of the Tā-Vā have been grounded in relational and social space binding people and things together.My art practice centralises the body as a site of resistance using the Tā/Vā Theory as a methodology for an embodied art practice. This presentation will talk to the work of the Pacific Sisters and the SaVAge K’lub. Two collectives I am deeply involved with representing over 2 decades of socially engaged art practice challenging and reframing ethnological tropes through the arts as cultural practitioners. CULT.ivators, FAB.ricators, Acti.VA.tors creating works of VA’rt. Using the body as the genealogical matter bringing the past into the present initiating Vā relationships with all that connects to it. This is the VA in the acti.VA.tion an embodied practice where the ancient and the modern co-exist. The Vā body mediating our place in the globe as we travel through time and space in the present, binding people and things forming new relationships, creating new narratives adding to our indigenous indexes past present and future. Sistar S’pacific aka Rosanna Raymond, an innovator of the contemporary Pasifika art scene as a long-standing member of the art collective the Pacific Sisters, and founding member of the SaVAge K’lub. Raymond has achieved international renown for her performances, installations, body adornment, and spoken word. A published writer and poet, her works are held by museums and private collectors throughout the UK, USA, Canada, Australia and New Zealand. Raymond’s practice works with people, spaces and things to acti.VA.te a dynamic relationship between them, to realise and reshape the ta-va duality. This is a choreographic process that extends beyond the frames of art, into both domestic routines and ritual protocols. It includes self-adornment and group enactments, activating space and collapsing time using the body and the genealogical matter. Chenta Laury, Wet Felting Workshop at HBF HQ, Video by NMGNetwork. On October 11, 2018, Chenta Laury and Matt Browning gave a free workshop on wet felting at HBF's HQ. Participants learned how to transform wool into colorful, felt geodes that will eventually become part of Laury's new commission for Honolulu Biennial 2019. Lucky for you, we filmed it! Natalie Robertson, Pohautea 1-4. 1995/2015. 3.25m x 1.2m. Natalie Robertson (Ngāti Porou, Clann Dhònnchaidh) is a photographic and moving image artist and Senior Lecturer at AUT University, Tāmaki Makaurau (Auckland). Much of Robertson’s practice is based in Te Tai Rawhiti, her East Coast Ngati Porou homelands. Here, her focus is on her ancestral Waiapu River and the protracted catastrophic impacts of colonization, deforestation, and agriculture. As a tribal member, Robertson sees it as a responsibility to protect the mauri (life force) of the river. She uses photography and video to record the state of the river, surrounding land and to communicate tribal narratives. Drawing on historic archives and tribal oral customs, her research terrain and artistic practice engages with indigenous relationships to land and place, exploring Maori knowledge practices, environmental issues and cultural landscapes. She has exhibited extensively in public institutions throughout New Zealand and internationally, including the 2016-17 multi-venue group exhibition Politics of Sharing in Berlin, Stuttgart, Waitangi and Auckland, and a 2014 solo exhibition Te Ahikāroa: Home Fires Burning at the C.N. Gorman Museum, California. Over the course of five years Robertson photographed for A Whakapapa of Tradition: One Hundred Years of Ngāti Porou Carving, 1830–1930, written by Ngarino Ellis, published in March 2016. In May 2017, the book won The Judith Binney Best First Book Award for Illustrated Non-Fiction in the Ockham New Zealand Book Awards. Robertson is also a member of Local Time (est. 2007) a collective which facilitates site-specific projects, honing in on local and indigenous contexts. Honolulu Biennial Foundation (HBF) announces the launch of Visions of the Future, a new initiative of programming presented by Honolulu Biennial Foundation, which debuted with a collaborative photography and multimedia exhibit,Flooded, featuring photography by Heami Lee, art direction by Allie Wist, food styling by C.C. Buckley and prop styling by Rebecca Bartoshesky and is curated by Isabella Ellaheh Hughes. This six-week, pop-up exhibition will take place in the heart of Waikīkī through a partnership with Luxury Row on the ground-floor of Luxury Row’s retail suite at 2124 Kalakaua Avenue; this also marks the first public exhibition of Flooded. Visions of the Future is a new programming initiative to complement the Honolulu Biennial, HBF's international contemporary art festival and primary program. Presented between biennial festivals, Visions of the Future will be a series of pop-up exhibitions, public programs and creative initiatives examining our most basic needs and what unites humanity globally, debuting with a focus on food through Flooded. Flooded is a vision which fuses climate change landscapes with food, and reveals the intimacy between our collective pasts and our possible futures. Inspired by sea level rise and coastal flooding, the work oscillates between the dystopic and utopic, exploring ideas of adaptation, solastalgia, and baseline shifting—how we react to change over time. These creations function as visible shadows and future artifacts of our changing planet. To learn more, click here. 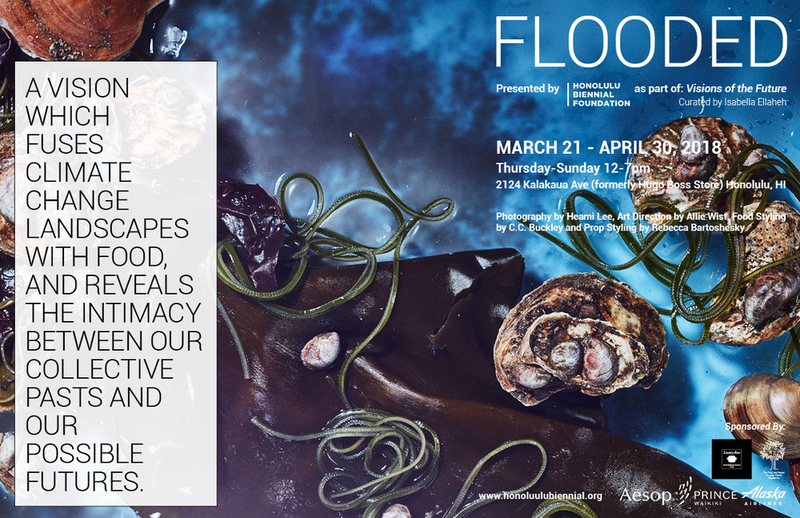 Flooded was open at Luxury Row – 2124 Kalakaua Avenue from March 21 until May 6, 2018. This exhibition was a result of the generous support of Luxury Row, The Taiji and Naoko Terasaki Family Foundation, Prince Waikiki, Alaska Airlines and Aesop, and is free and open to the public. Artist panel featuring Heami Lee and Allie Wist, who will offer greater insight into the works in Flooded, their backgrounds, hopes for the future, as well as highlight the multifaceted collaboration between them, Rebecca Bartoshesky and C.C. Buckley to create this body of work and what it means to be exhibiting this series publicly for the first time. Wally Ito, a marine biologist and the Limu Hui Coordinator at Kua'aina Ulu 'Auamo (KUA), will be talking about limu's (seaweed) uses as food and its environmental and Hawaiian cultural importance. He will also discuss some of the threats to limu and what communities are doing to bring it back. Co-presented by CONTACT and HBF, Chris Ritson, who was raised on Oʻahu and continues to live and work above Honolulu on Mt. Tantalus, will discuss his practice, which is informed by society's relationship to Nature, and ranges from video and installation to living, generative sculpture. An alumni artist of Honolulu Biennial 2017 with his Mushroom Paintings, Ritson will be exhibiting a continuation of his living, Mushroom Paintings in CONTACT, contact zone, which runs from April 6-21, 2018. Hear Fung Yang speak about his journey from Olympic sailor to starting a recycling company, which ultimately led him to starting his organic mushroom farm, Small Kine Farm ((http://www.smallkinefarm.com/about-us/) and why he believes mushrooms are the sustainable food of the future. Join Sean Connelly (After Oceanic, Islander Institute, HBF '17) in a workshop to explore the future of Honolulu as ahupua'a and explore how human-built systems like cities can move ecologically in space and in time. The masterclass will focus on the ahupua'a of Waikīkī through a 3D interface designed to facilitate spatial thinking and redefine creative pathways that transform learning, collaboration, and consensus building in the process to recover ahupua'a and ‘āina systems. Rebecca Bartoshesky is a New York based prop and interior stylist. Born on the Eastern Shore of Maryland, Rebecca moved to New York City to attend FIT. After graduating with a BFA in Interior Design, she turned the tide and began her career in prop styling. Arranging objects and creating environments that tell a story bring her joy. When she’s not on set she can be found climbing over fences. CC Buckley is an herbalist and food stylist who envisions plants as crucial partners and allies in a healthful future. She is currently working on a book about medicinal plants for Roost. Heami Lee was born in Seoul, South Korea and moved with her family to Queens, New York when she was five. Now Brooklyn-based, the photographer’s images focus on portraits, food, travel, interiors, and still-lifes. When she’s not photographing she can be found sipping cappuccinos while people watching. Allie Wist is an artist, art director, and independent researcher from Brooklyn, NY whose work is anchored in food culture, food systems, and climate change. She received her MA from NYU in Food Studies and was most recently an art director at Saveur Magazine. She currently teaches food and performance art at NYU. Mariquita Micki Davis, Magellan Doesn't Live Here (still), 2012-2017. Image courtesy of the artist. Our new, neighbor island programming initiative, Island Hopping, brings select artworks from Honolulu Biennial 2017 (HB17) to the neighbor islands in the fall of 2019. Our next stop is Maui! HBF aims to share with a broader audience contemporary artworks from the cultures and continents linked by the Pacific Ocean. Impact Hub Honolulu is seeking local artists to create in our 14,000 sf coworking space in Kaka’ako. The space is covered in blank canvases and they need your creative energy to inspire possibilities. Everything from walls to floors to ceilings is awaiting your talent. In exchange, they can provide coworking membership and/or studio space for you to create and join their movement. They will also cover the cost of materials for any creative pieces made for the Impact Hub. Duration and type of membership are negotiable. We want to work with you to come up with trades that help beautify their space and give you a fantastic space to showcase your work and hopefully work out of! This is an initiative of Impact Hub and Honolulu Biennial Foundation to provide more exhibition opportunities and work spaces for Hawaii's brilliant creative community. Impact Hub Honolulu is a unique coworking, event, office, and community space specializing in building community and making impact. Impact Hub is part of a global association of over 15,000 members and 102 Impact Hubs worldwide. We believe that building a vibrant, diverse, and active community creates an eco-sphere where members support one another by lending time, leading workshops, hosting events, expressing themselves through art, providing funding and mentorship, launching companies, and exploring the future. Together.